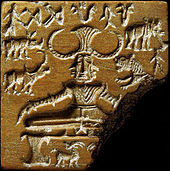 A seal discovered during the excavation of Mohenjo-daro has drawn attention as a possible representation of a "proto-Shiva" figure. This Pashupati (Lord of animal-like beings) seal shows a seated figure, possibly ithyphallic, surrounded by animals. Sir John Marshall and others have claimed that this figure is a prototype of Shiva and have described the figure as having three faces seated in a "yoga posture" with the knees out and feet joined. However, this claim is not without its share of critics, with some academics like Gavin Flood and John Keay characterizing them as unfounded.